The jet vanished from radar screens on Sunday morning with 162 people on board, as it approached violent weather over the Java Sea about 40 minutes into a two-hour flight between the Indonesian city of Surabaya and Singapore. The plane, an Airbus A320-200 operated by an Indonesian subsidiary of the Malaysian budget airline AirAsia, reportedly requested to deviate from its flight path to avoid a cloud. Moments later, it lost contact with Jakarta air traffic controllers. It did not send a distress signal. Based on data “pings” from Flight 370, authorities believe the plane crashed into the southern Indian Ocean, a vast, deep, isolated stretch of water far from the last known position of the plane. The AirAsia flight was carrying enough fuel for about four hours of flying. Assuming it crashed soon after it dropped off the radar, finding it should be far easier. 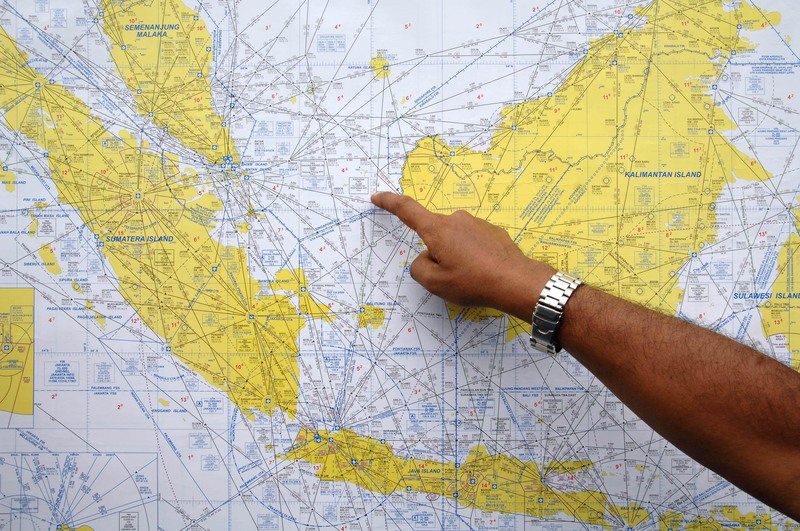 The Java Sea is a contained body of water, shallow, and crisscrossed by planes and ships. In normal circumstances, a plane leaves wreckage even if it enters the water largely intact. It can take several days for it to be spotted, however. On Jan. 1, 2007, an Indonesian jetliner carrying 102 people went missing on a domestic flight from Surabaya to Manado. A search effort across land and sea turned up nothing until 11 days later, when a fisherman found the plane’s right horizontal stabilizer. Similar problems are thought responsible for the ditching in the Atlantic of Air France Flight 447 in June 2009, that killed all 228 people aboard. However, there are problems with this theory. Firstly, cockpit recordings indicate the Air France crew hadn’t been trained for such circumstances. But ever since, Airbus has put new training in place so that all pilots who fly their aircraft know how to deal with these occurrences. “It’s a new regime,” says [Captain Desmond Ross, an Australia-based aviation expert]. What’s more, the Air France flight was in the dead of night and so the crew only had instruments to rely on. “I don’t even think they had a horizon,” says Ross. It is unlikely such a tragedy would have occurred in daylight conditions such as QZ 8501 experienced. AF447 was an Airbus 330 from Rio de Janeiro to Paris that plummeted 38,000 feet in 3 minutes and 30 seconds and crashed into the Atlantic Ocean in 2009. In that case, pilots responded to a stall, induced by inconsistencies between the airspeed measurements likely due to pitot tubes being obstructed by ice, by pulling the nose up instead of pushing it down to attempt a recover. The speed of the airplane will likely be at the forefront of any investigation, said John Cox, a former accident investigator. Radar suggests the plane was flying at a low speed, Cox said. Too slow at certain altitudes will cause an airplane to physically stall with insufficient lift to sustain flight, he said. Geoffrey Thomas, editor of airlineratings.com, said he reviewed radar data of the flight obtained by other A320 pilots showing the plane at an altitude of 36,300 feet and climbing and traveling at 353 knots or roughly 406 miles per hour — a relatively low speed for that altitude. [M]any Malaysians are now trying to reckon with the fact that Malaysian-owned carriers will have been involved in the three worst air tragedies of the past year, including Malaysia Airlines Flight 17, shot down over the Ukraine. That’s an unlikely status for any country, much less Malaysia, population 30 million, and hardly a global aviation power. It’s tempting to look for a common thread to explain this inexplicable string of bad aviation luck. But prior to March 2014, Malaysia’s two major carriers had exemplary safety records, and there was absolutely nothing about them to lead an outside observer to believe that they’d lose three jets in nine months. If the Indonesian-registered aircraft is confirmed to have crashed, killing all on board, the accident would make 2014 the worst year for loss of life in civil aviation since 2005, when 1,014 people were killed in passenger accidents, according to the Netherlands-based Aviation Safety Network.